South by Southwest is one of the most popular festivals in the U.S. and one of the most influential events held around the world today. Hundreds of thousands of attendees converge on the Austin, Texas-based festival and conference every year to discover the latest and greatest in film, interactive media and music. As a gathering of who’s who in contemporary art and technology, SXSW has become a dream platform for brands looking to declare or preserve their position in the market. Intrinsic Wine Co. is a brand with an appreciation for street art as deep as its roots in winemaking. Naturally, the creative and connected audiences at SXSW were ideal for gaining brand awareness. Intrinsic desired a visibility campaign that would utilize guerrilla-style marketing tactics to reach attendees and incorporate their label’s artist-designer, Zimmer. With a deep understanding of available media, audience behavioral patterns, and events taking place in the market, EMC Outdoor proposed a solution comprised of live-painted murals, video projections and wrapped rideshare vehicles. This three-pronged approach was designed to reach people in ways that were relevant to their experience at SXSW that would also build value for the brand—connecting with people through art and providing a rideshare service. This strategy offered high-impact messaging that garnered high impressions and was reinforced for the duration of the festival. The approach was significant in keeping low any unnecessary costs and hours spent chasing down permits and media space. 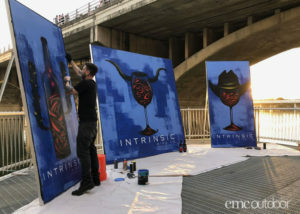 The mural experience consisted of three 8-foot-tall boards upon which the artist, Zimmer, painted Austin-themed variations of his Intrinsic label design. This component of the campaign took place during the opening weekend at SXSW, in locations our team had previously scouted. The paintings were primed and partially painted in a staging area. Then, they were completed in a final “showcase” in a park just below the Congress Avenue Bridge. This was an iconic bat-watching vantage point in Austin and packed with crowds lounging and soaking up the sun. The activation became interactive as the artist asked onlookers to assist with the finishing touches of his artwork. The pieces lived on throughout the week as visual and tactile advertisements for the brand. 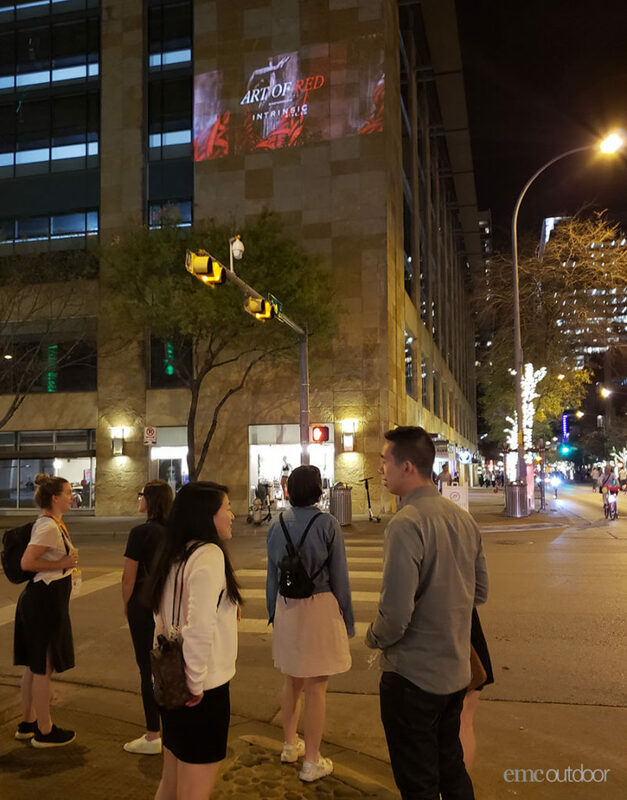 Projection advertising is a street-level guerrilla marketing tactic that displays video graphics on buildings around busy urban hotspots and nightlife. Intrinsic was attracted to this concept since it was easily activated in desired locations and relocated as needed. The EMC team researched and scouted backup locations that would garner traffic while conforming to aid-to-retailer alcohol advertiser regulations. 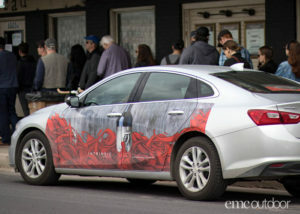 The third component of the campaign was graphic-wrapped rideshare vehicles used during the second weekend of SXSW. The vehicles gave riders an up close view of the brand when they stepped in. They stayed localized to the Convention Center, garnering impressions from people walking and driving through that area. One rideshare passenger said he saw the wrapped car the night before, tried the wine, and liked it! 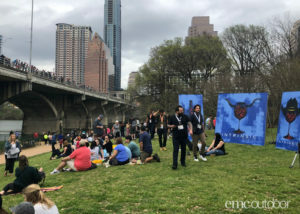 The Intrinsic campaign at SXSW successfully garnered valuable impressions for the brand at one of the year’s most influential events. Our strategy used tactics that extended and reinforced brand messaging throughout the event. It reached people in relevant ways by using art and providing a service, which helped build value for the Intrinsic brand. Our onsite team was present at every step to ensure the program’s success and Intrinsic’s needs were met! 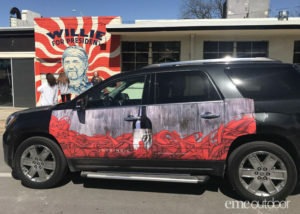 March 26, 2019 | Filed under Daily Updates, Event Marketing, Featured, Guerrilla Marketing, Painted Wall, Projection and tagged with 2019, Austin, convention, event marketing, experiential, festival, murals, out of home, out of home advertising, outdoor advertising, projection media, South-by-Southwest, SXSW, wrapped vehicles.